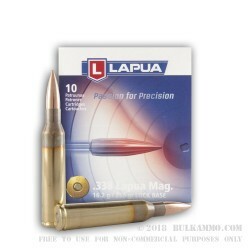 This .338 Lapua cartridge by Lapua features a 250 grain Lock Base projectile. 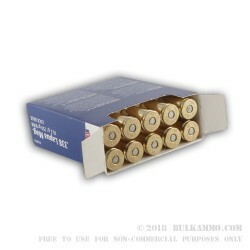 Because its full metal jacket envelopes even its base, this bullet is able to withstand its higher chamber pressure and high muzzle velocity of 3,018 fps. The jacket further provides superior penetration and will preserve your rifle’s bore against the rapid accumulation of lead fouling. This bullet’s boat tail design gives it a tapered base which substantially improves its accuracy, increases its ballistic coefficient, and grants it some immunity against the deleterious effects of cross winds. The culmination of all its bullet’s features makes this round the one to look for when flat trajectories and long-range accuracy matter to you above all else. 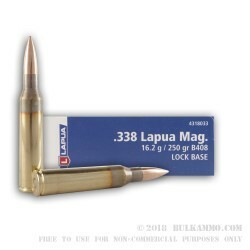 Since their establishment in 1923, Nammo Lapua Oy and Nammo Schönebeck has manufactured fine ammunition from high quality components that has won them tremendous respect among competitive shooters across the world.